Warren BH, Bermingham E, Bourgeois Y, Estep LK, Prys-Jones RP, Strasberg D, Thebaud C. 2012. Hybridization and barriers to gene flow in an island bird radiation. Evolution (online). Abstract. While reinforcement may play a role in all major modes of speciation, relatively little is known about the timescale over which species hybridize without evolving complete reproductive isolation. Birds have high potential for hybridization, and islands provide simple settings for uncovering speciation and hybridization patterns. Here we develop a phylogenetic hypothesis for a phenotypically diverse radiation of finch-like weaver-birds (Foudia) endemic to the western Indian Ocean islands. We find that unlike Darwin's finches, each island-endemic Foudia population is a monophyletic entity for which speciation can be considered complete. In explaining the only exceptions - mismatches between taxonomy, mitochondrial, and nuclear data - phylogenetic and coalescent methods support introgressive hybridization rather than incomplete lineage sorting. Human introductions of known timing of one island-endemic species, to all surrounding archipelagos provide two fortuitous experiments; (1) population sampling at known times in recent evolutionary history, (2) bringing allopatric lineages of an island radiation into secondary contact. Our results put a minimum time bound on introgression (235 years), and support hybridization between species in natural close contact (parapatry), but not between those in natural allopatry brought into contact by human introduction. Time in allopatry, rather than in sympatry, appears key in the reproductive isolation of Foudia species. The authors show that Madagascar Red Fody F. madagascariensis and Forest Fody F. omissa have been hybridising for over 10000 years, and not only since felling of most of Madagascar's forest cover which has brought the two species into closer contact. 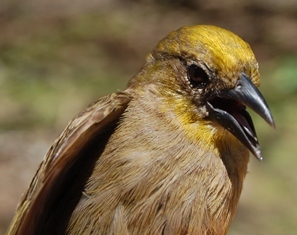 Previous news: ringing of Seychelles Fody, see here.